Penny toft has horses in her blood, coming from an equestrian family she started out making a name for herself in the show ring. Having won many champion hack & pony, in harness and ridden classes aswell as winning Horse of the Year titles, Penny decided to make the switch to endurance. This change of direction proved hugely successful and Penny is well known among the best endurance riders Internationally. 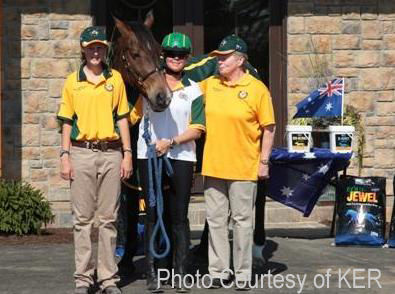 In 2001 Penny was third at the WA Tom Quilty, in 2002 she was a member of the bronze medal winning team at WEG in Jerez. In 2003 at the Tom Quilty in NSW she was 3rd and in 2004 she competed in the Tevis Cup USA for a 17th place overall. Penny has competed and in and won many Gold, silver, and bronze medals at World Championships. Penny will be riding Don, a seasoned Part Arabian Endurance Horse. He is bay,14 years and over the last 5 years has been succesfully completing 160km rides with Penny. He competed in the World Endurance Championships in Malaysia for an overall 18th place. Penny says „Don is in his prime and has never been better“. When did you arrive in the US? Where have you and Don been based since arriving? We have been extremely priveleged to have been based at theKentucky Equine Research Farm in Versailles. We have had the use of the Farms fascilities including Walker, Treadmill, paddocks and convenient trails. The Horses have settled in well to their routine and it will be hard to move on to the Horse Park later this week. My Husband, Peter and Daughter (Groom), Alexandra are staying on the Farm with DON.